I scanned the carts in front of the clubhouse, searching for the one headed to the 7th hole for our shotgun start at Mammoth Dunes. Jordan, the friendly young attendant who’d earlier said he’d be ferrying us to our opening hole, saw my confusion and waved me over. He was standing next to a well-used pickup truck just ahead of the carts and holding a sign with the number seven on it. He eagerly took my clubs and slid them into the truck bed, where they were joined by three other golf bags and two caddies. There were three other pickup trucks in front of ours all similarly loaded. I’ve seen and experienced quite a bit during my years writing about golf, but this was a first. Yes, Mammoth Dunes is that big, that sprawling, and that rugged in spots that it necessitated a little four-wheel drive assistance to get us out to our starting holes on the far side of the property. 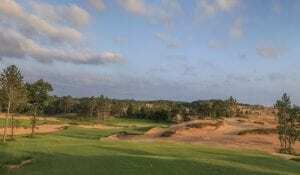 Mammoth Dunes is the second course to open at the spectacular Sand Valley Resort in America’s Dairyland, joining the original Coore & Crenshaw design. But don’t think David McLay Kidd’s jaw-dropping layout is playing second fiddle. Not even to the original Bandon Dunes course the Scottish-born Kidd built back in the 1990s on a remote stretch of Oregon coast, a seminal project that marked his architectural breakthrough and helped developer Mike Keiser usher in the era of destination golf. Keiser has long said that one golf course is a curiosity and two makes a destination. 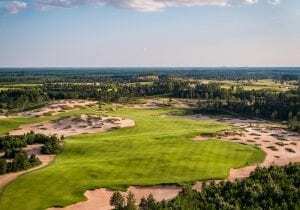 With the addition of the aptly-named Mammoth Dunes, Sand Valley has indeed stamped itself as a bucket-list destination, boasting a one-two punch that rivals just about any golf resort in the country. The former pine tree farm is about a three-hour drive from Milwaukee, three-and-one-half hours from Minneapolis, and four hours from Chicago, which, quietly perhaps, has the third-most golfers of any metro area in the country, according to the National Golf Foundation. There are no ocean views in the middle of Wisconsin, but both courses are loaded with visuals, built on a vast sandy expanse and heaving topography dotted with pines. Both courses have a natural feel, with wide fairways and sand dunes and blowouts aplenty. But for all of their first-glance similarities, Mammoth Dunes is very different from its slightly older sibling. As the name would suggest, Mammoth Dunes is bigger. 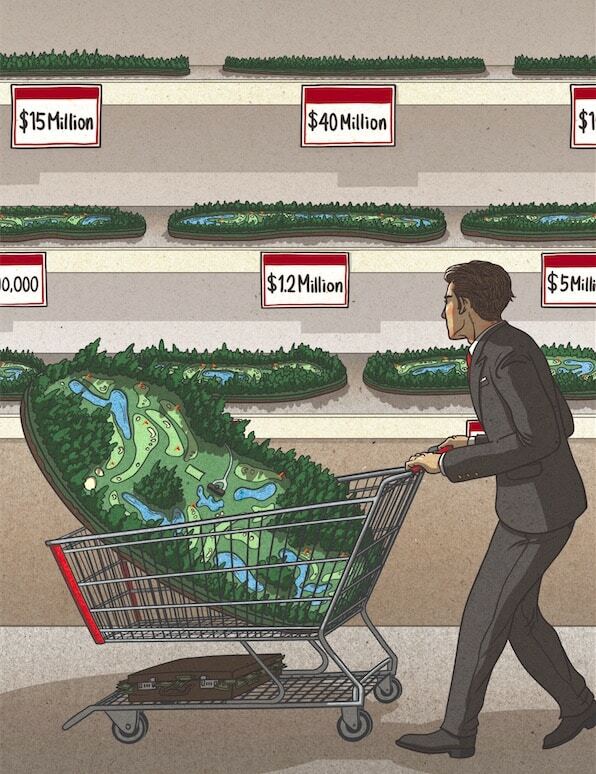 It has 20 percent more grass than the Coore & Crenshaw course and some fairways that are wider than a football field. 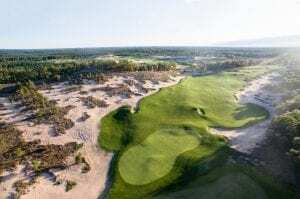 These enormous driving corridors surrounded by sand are part of Kidd’s effort to enhance playability, allowing golfers to swing freely and with confidence. The overall scale of the property is also grander, with several holes built along, on, and over an 80-foot-tall ridgeline that serves as the defining topographical feature of the course. 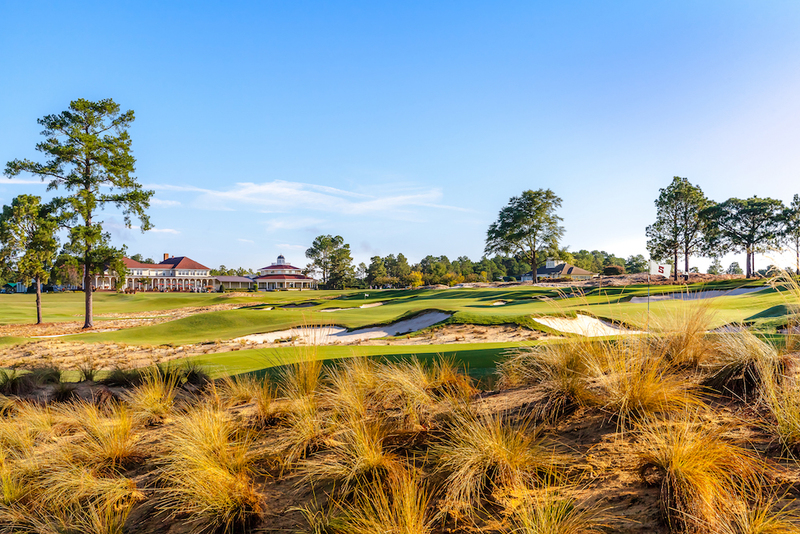 Among those holes, perhaps the most notable are the par-three 13th, with the ridge as a sand-pocked backdrop, and the potentially drivable par-four 14th, which dives downhill from a teeing ground that’s among the course’s highest points. The two courses expertly represent the natural habitats that existed on site long before the red pine plantations that came in at the start of the 1900s. Sand Valley has a few more sandy waste areas while Mammoth Dunes features an “Oak Tree Savannah,” a group of old-growth oak trees that have grown on and around the V-shaped ridgeline. 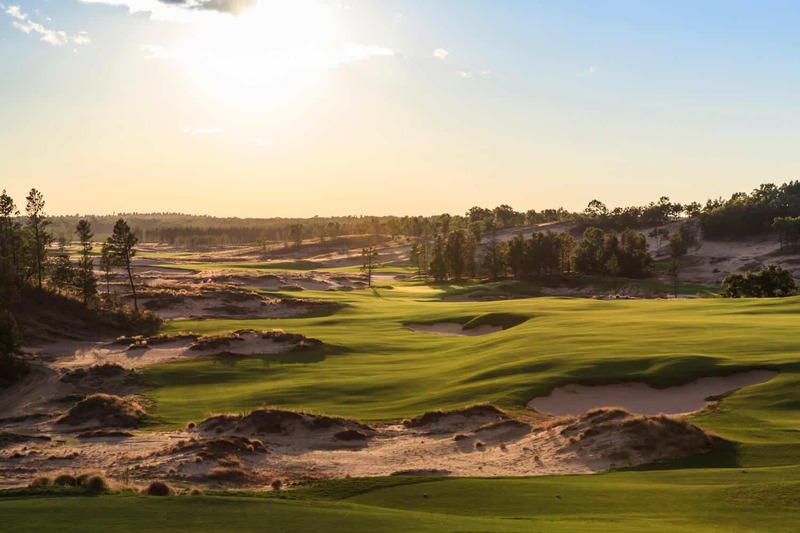 Keiser has uttered the name “Pine Valley” when talking about the Sand Valley property and Mammoth Dunes evokes a bit of the New Jersey masterpiece, particularly in how the routing is compartmentalized, as Kidd puts it, meaning many of the holes are separate from one another. There’s much more of that secluded feel on Mammoth Dunes than on the Sand Valley course. 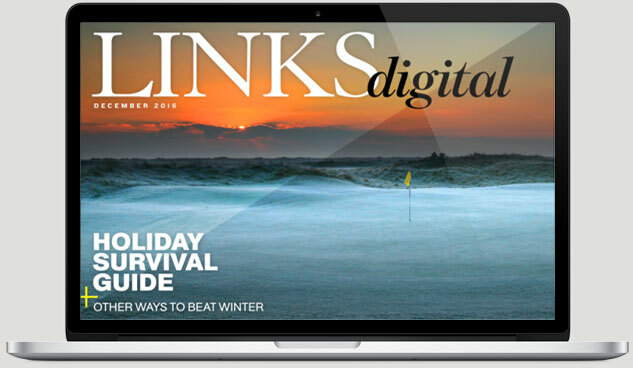 “I really wanted to take the golfers on an adventure, an exploration through the landscape,” Kidd told me as we stood behind the clubhouse, watching players decide whether to target the upper or lower part of the fairway on the 1st hole at Mammoth Dunes. Another difference between the two courses is a tad more technical. The greens that Bill Coore and Ben Crenshaw built at Sand Valley are slightly pushed up, elevated, and surrounded by contours. Balls that spill off the greens or bounce close to the edges tend to roll away. At Mammoth Dunes, Kidd sought to settle many of the greens into natural pockets, with contours around them that feed slightly off-target shots onto the putting surface. A first-time visitor might not notice, but there are hidden slopes near the greens at the 5th, 15th, and 16th holes that help kick shots forward and toward the putting surfaces. One of my favorite differences between the two courses, though, has nothing to do with the design or overall look of the layouts. Instead, it’s the unique Mammoth Dunes logo. It was Keiser who picked the name of the course. Kidd wasn’t initially sure whether Keiser was leaning toward “mammoth” because of the extinct hairy elephant or the grand scale of the property. Ultimately, it works both ways, and featuring the woolly mammoth (curved tusks and all) as the course’s distinct branding on hats, apparel, flasks, and other wares in the Sand Valley pro shop is another birdie for Keiser. Early returns—from players and caddies—currently indicate that Mammoth Dunes is getting the more favorable response between the two Sand Valley courses. I, too, preferred Mammoth Dunes, with its wide fairways loaded with strategy and angles within the field of play, and it will get even better with more time to mature. Of course, this is like quibbling over two classic music albums or great works of art. Both courses at Sand Valley are spectacular, which is pretty much par for the course for the Keiser family and their golf projects. And with two similar yet disparate layouts—not to mention a fun 17-hole par-three course called The Sandbox and another course potentially on the way—Sand Valley is indeed a golf destination. It’s a little off the beaten path, but well worth the journey.